You turned my head with your Tina Turner references and bold statements. Titled ‘We Don’t Need Another Hero’ after the Turner track, the 10th Berlin Biennale [BBX] struck some chords! A rejection of power dynamics that have long had a stronghold over the arts as an industry; a confrontation of the complexities of our current world; an acknowledgement that there are many artists who act beyond art, the intention serves as a reminder of those whose activism uses tools that resonate with the public consciousness at a different level. “The 10th Berlin Biennale does not provide a coherent reading of histories or the present of any kind. Like the song, it rejects the desire for a savior. Instead, it explores the political potential of the act of self-preservation, refusing to be seduced by unyielding knowledge systems and historical narratives that contribute to the creation of toxic subjectivities,” the website reads. I was nodding like Winston before my plane had even landed. BBX continues the dialogue that many marginalised identities are having anyway – about patriarchy, Blackness, race, ‘otherness’, geography, power, sexuality, gender and so on. Power dynamics have historically and significantly affected the way art and artists are regarded in society, and dangerously, it has skewed public perception about who “gets” to be an artist. The exhibition leaned into this dismissal of “permission”, that artists all over the world are no longer waiting for permission to create, present or develop their own infrastructure. 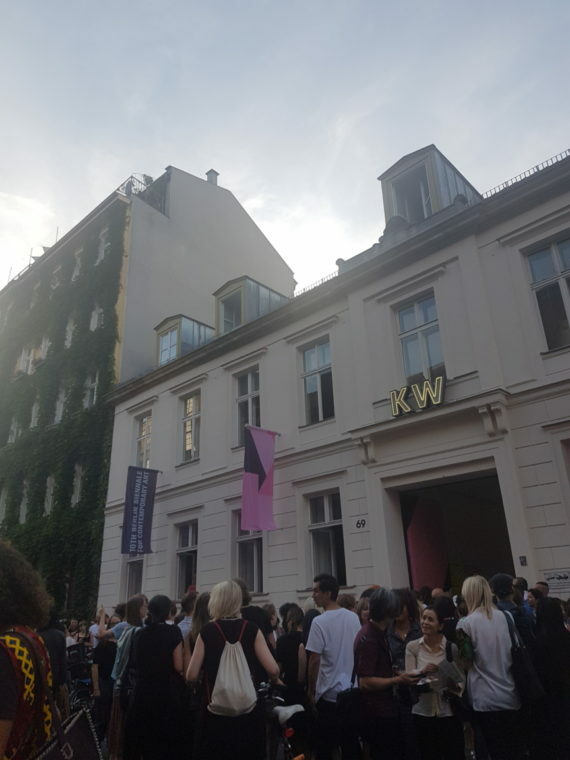 This year’s festival was curated by Gabi Ngcobo, supported by Nomaduma Rosa Masilela, Serubiri Moses, Thiago de Paula Souza, and Yvette Mutumba, spanning across various sites in Berlin. The show reflects the ever changing local, diverse and artistic context. Under Ngcobo’s curatorship, I could bear witness to a rarity in mainstream international art spaces and contexts. It was time to publicly address the things many other spaces wouldn’t. 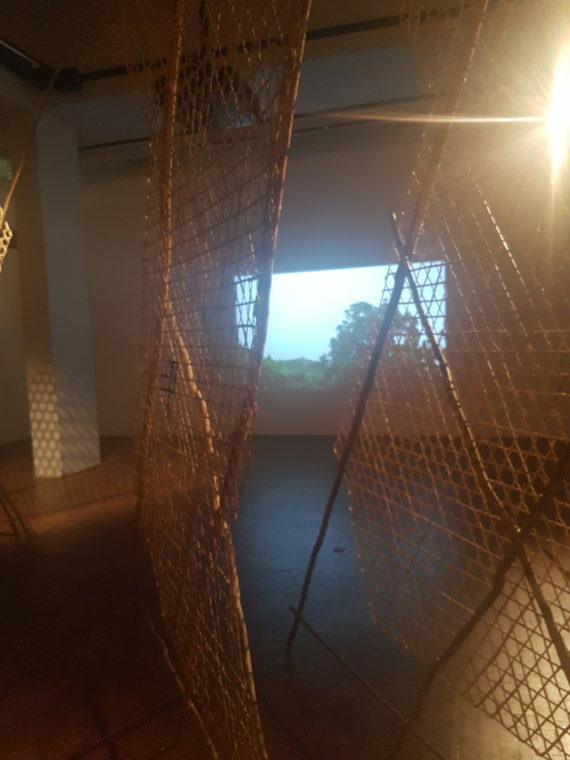 Taking the city, history and politics of Berlin as its starting point, it was interesting to view provocations on (post)colonialism and capitalism within largely white art institutions. I spent most of my time at the Akademie der Künste, the KW Institute for Contemporary Art and the ZK/U – Center for Art and Urbanistics. Ordinarily, I’d have been nervous about entering European arts institutions solo (and I definitely wouldn’t call myself an arts newbie – but such is the lack of emotionally safe spaces in my experience). Yet, I was comforted some by the knowledge that Black women, in particular, led the design of this experience. 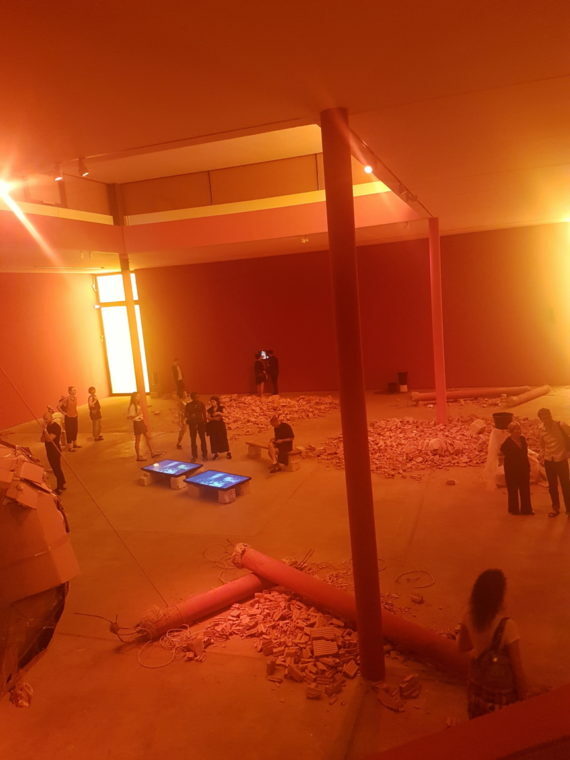 This was my first Biennale, and though I was particularly daunted beforehand, I damn near skipped through the galleries. I saw Nina Simone and photography featuring Black British MC No Lay, I saw dedications to streets in Handsworth where I spent my teenage years. I heard stories, saw figures, narratives, art forms, sacred practices and experiences I recognise. The generosity of space – literal and philosophical – granted to this work was phenomenal. If Western galleries weren’t so narrow in thought, the breadth presented would be common practice. I fell in love with the work of Firelei Baez in particular, as well as Sondra Perry, Tony Cokes, Belkis Ayon and Dineo Seshee. There were two stand out pieces in particular for me – one of which was Mario Pfeifer’s Again / Noch einmal (2018). This two-channel video installation examined a recent national case that highlighted Germany’s xenophobia towards migrants. 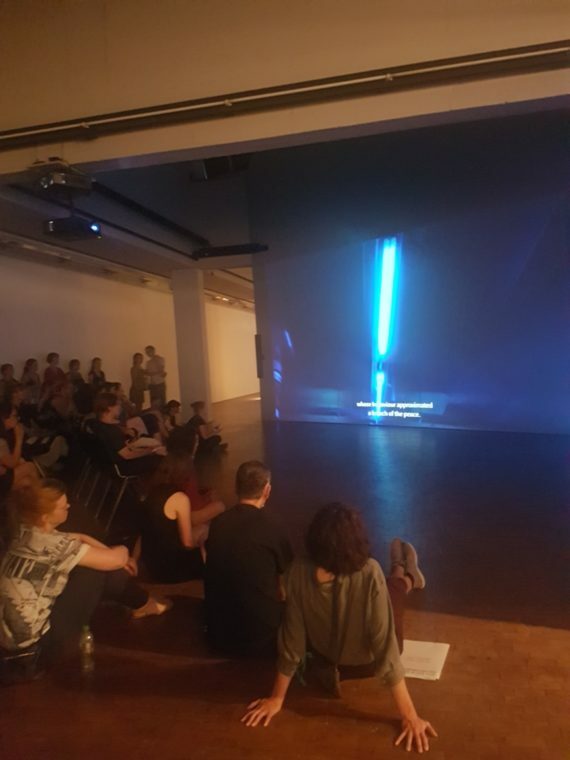 The performative re-enactment documented the death of an Iraqi refugee who had a history of mental illness and was attacked by a group of German men for what was described as “civic courage”. The other was Okwui Okpokwasili’s installation, Sitting on a Man’s Head (2018), which I found almost imposible to move away from. I lost track of how much time I spent reading pages that lined the walls filled with reflections in relation to an unidentified series of self-care provocations, eventually leading to the work’s centrepiece: an empty room, covered from floor to ceiling in thin sheets. The space demanded quiet, mutual respect, in an almost meditative state kind of way, Amidst the mayhem of a busy gallery, the solitude was craved. There were times I felt at home, like flicking through a family photo album. In particular, Liz Johnson Artur’s ‘Black Balloon Archive’ helped me find the familiar in the uncomfortable. However, just like any home, everything isn’t rosy all the time. Sometimes, like at a family gathering, there’s only so long you can hear your Uncle repeat the same story before you start to feel lethargic. There’s only so long before the white guests’ constant ogling at your nan’s china cabinet starts to feel like a microaggression. BBX isn’t to go without critique. Most notably, the placing of Luke Willis Thompson’s 2017 autoportrait, a silent portrait of Diamond Reynolds, the partner of Philando Castile, who was murdered by police officer Jeronimo Yanez in 2016. I have issues with non-Black artists using Black trauma for art and aesthetics, regardless of the subject’s permission. Blackness and Black trauma are not momentary subject matters. As a white passing (half Fijian) artist, Thompson uses police brutality and the lived experience of Black pain and womanhood as the raw material for his work and no cases for its inclusion have appeased this sense of exploitation. On occasion, I’d also find myself staring blankly at work, unsure if I wasn’t a fan of what I was seeing or if I was just missing something I was “supposed to get” (I am all too familiar with the pretentious art world stereotypes). At times, I felt the labelling which could have helped was instead vague, clunky, inconsistent or oddly positioned. This felt like another test – how can I formulate my own opinions if I feel or understand nothing? At the time of the BBX launch, I had been engaged in widespread discourse about the shortage of Black women in artistic place-based leadership. In the time since, Sharna Jackson was appointed Artistic Director of Site Gallery in Sheffield, Theatre Peckham has appointed Suzann McLean as Artistic Director and Doreen Foster was announced as the new Director of Warwick Arts Centre. The sceptic in me doesn’t want to get caught up in the romanticised notion of change. The industry has work to do and I am constantly thinking about what Javaad Alipoor refers to as the “racialisation of risk”. I’m left with an even stronger will to build the infrastructure Black artists need to sustain their work. I will be returning to Berlin at the end of the year, ready to re-examine the level of inclusion within the institutional art spaces in the biennale aftermath, particularly in proximity to such a prominent DIY culture.